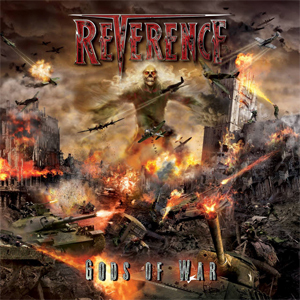 US power metal band REVERENCE will release their new album, Gods Of War, on October 21 in Japan via Marquee/Avalon and the rest of the world through Razar Ice Records on November 4, 2015. The CD cover artwork was designed by renowned artist Jobert Mello of Sledgehamer Graphix (PRIMAL FEAR, SABATON, HYSTERIA) and can be seen below. REVERENCE is fronted by vocalist Todd Michael Hall (RIOT V, JACK STARR'S BURNING STARR), Bryan Holland (TOKYO BLADE, ARREST) on guitars, Pete Rossi (OVERLAND, SANXTION) on guitar, Michael Massie (OVERLOADED, INNER RECIPE) on bass guitar and Steve ‘Doc Killdrums’ Wacholz (founding member of SAVATAGE, CRIMSON GLORY) on drums. REVERENCE recently released a teaser clip for the song "Race To Obscene", which will appear on their upcoming album. REVERENCE’s second album will follow their first release, When Darkness Calls, which was released through Razar Ice Records in 2012. The clip below allows fans to get a quick peek of their upcoming album. The impending power metal assault is coming you way, take cover!